Our lilac bushes have been full of flowers the past few weeks. Lilacs are among my favorite garden flowers, because they produce many large clusters of very fragrant flowers that last for weeks. They are one of the few common garden flowers that have a great flowery scent. Unfortunately, lilacs only bloom once a year. 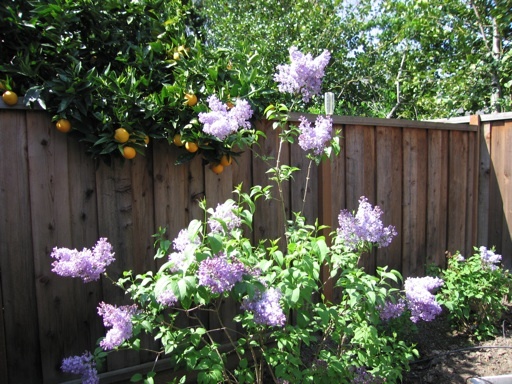 My partner and I planted descanso hybrid lilacs that were developed for mild winter climates. We have three of the Lavender Lady variety, one of the Blue Skies variety, and one of the California Rose variety, which are all lavender in color. This year our Lavender Lady and Blue Skies bushes are coming into bloom with many more flowers than in previous years. I think they are blooming so much this year, because we took the time to fertilize them two or three times last summer. 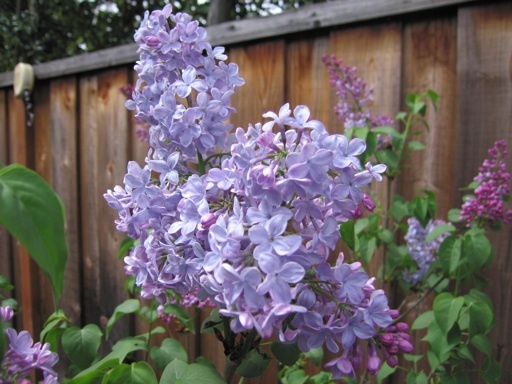 Although, our California Rose lilac has only two small clusters of flower buds on it. But that could be because it is growing in a dry spot next to our house where it doesn’t get much sunlight. Our oldest Lavender Lady lilac has produced offshoots that are rooting near the base of the plant. My partner dug up one, and it was full of roots so he transplanted it to grow into a new bush. It seems to have taken to the transplant well so far. We plan on digging up more of the offshoots to get even more lilacs. My mom transplanted an offshoot from her white lilac a few years ago, and it has already grown into a medium size bush that is full of flowers. I am not sure if the lilacs we planted were grafted, but they don’t look like they were grafted. Obviously, if they were grafted onto the rootstock of different variety, then the offshoots won’t be genetically the same as Lavender Lady. 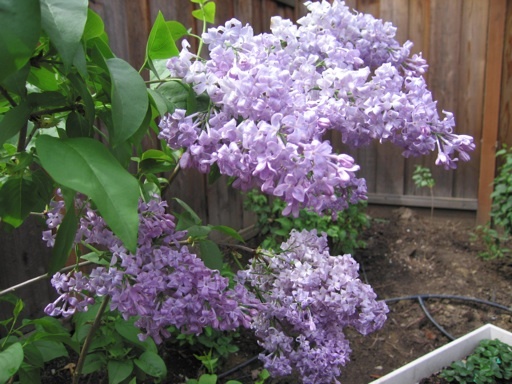 We also planted one Sensation lilac, which has a deep purple color fringed with white. Our Sensation lilac is full of buds that haven’t opened yet, even though Sensation is not a Descanso hybrid and is supposed to require a more pronounced winter chill to stimulate bloom.